Several diseases, including asthma, heart attacks and emphysema, have been linked to improper waste management. Garbage is a paradox in Bengaluru. Even though garbage dumping and burning in street corners is illegal, and in spite of the Bruhat Bengaluru Mahanagara Palike (BBMP) outlining penalties for those who violate rules, the practice continues to be rampant in the city. Garbage contractors, who are tasked with collecting waste from bulk generators like apartments, often dump the waste on the side of unused roads and set it on fire. “It is a cycle of collecting, dumping and burning waste. The contractors and pourakarmikas are under pressure to clear the waste they collect and often set fire to the waste instead of properly disposing it in landfills,” explains Kathyayini Chamaraj, an activist based in the city who focuses on solid waste management. The most common forms of burning garbage is the burning of leaf litter. “Since those handling waste believe that burning leaf litter is harmless, this tends to be commonly burnt in the fall season. However, burning leaf litter is equally toxic and causes air pollution,” adds Kathyayini. In addition to leaf litter, several other waste materials are also burnt on the sides of roads. This leads to the release of methane, carbon monoxide, nitrogen oxide, sulphur dioxide and carcinogenic hydrocarbons into the air. Burning of garbage is also classified as the third biggest contributor to greenhouse emissions in the country. According to a crowd-sourced map compiled by Jhatkaa.org, an organisation which has been campaigning against garbage burning for over two years now, garbage burning is still happening in at least 40 wards in Bengaluru. There are times when the landfills themselves catch fire, like the fire at the Belahalli quarry that occurred on April 11. Live map being maintained by Jhatkaa.org to track garbage burning in Bengaluru. You can report garbage burning in your area to Jhatkaa.org via WhatsApp on 888-498-3333. People involved in disposing off the waste, particularly pourakarmikas or civic waste workers who are asked to burn the waste by their contractors, are unaware of the health risks posed by the burning of garbage. “We are asked to burn garbage at times by contractors. For instance, some of my colleagues burnt the waste they collected on the side of Old Madras Road recently, but they are unaware of the dangers of what they are doing,” says Lakshmi, a pourakarmika from Indiranagar. Burning garbage is a double-edged sword for these pourakarmikas not only because it is illegal but also because the BBMP does not provide safety equipment like gloves for them to manage waste. Studies have shown that burning garbage poses serious health risks. The US Public Health Service has identified 22 diseases linked to improper waste management. These diseases include asthma, heart attacks and emphysema, which have been specifically linked to burning of garbage. “PM 2.5 materials cross the air alveolar membrane, which is the filter of the lung, and are able to get deposited in the blood vessels of the heart, which initiates the process of clot deposition. In a short period of time, this leads to clot formation in the heart and along with that, any sudden increase in pollution levels will lead to exaggeration of that particular block and lead to heart attacks,” explains Dr Rahul Patil, a cardiologist at the Jayadeva Institute of Cardiovascular Sciences and Research in Bengaluru. Dr Rahul, who is also associated with the research wing at Jayadeva Hospitals, says that in the last five years, statistics indicate a huge rise in heart attack cases in the under 40 age group. “Our records indicated a 22% increase and often they come without common factors linked to heart attacks like hypertension, obesity and diabetes,” he says. The spurt was particularly high in April 2017 when the hospital registered over 1,000 cases of heart attacks, all in the under 40 age group. “On the basis of the study, we found that the population that is exposed to pollution is predisposed to have heart attacks, that is mainly cab and auto drivers,” he adds. A study by Aishwarya Sudhir published by Climate Trends and Co Media Lab, a city-based organisation, showed that fine particles (PM 2.5) in the air would touch hazardous levels during peak traffic hours in the city. The reasons for the high levels of emission were attributed mainly to vehicular emissions and open waste burning. The study highlighted that open waste burning contributed to 16.1% of the city’s concentration of PM 2.5 particles. Meanwhile, a study by Dr Paramesh, a paediatric pulmonologist at the city’s Lakeside Center for Health Promotion, found that asthma among children is also on the rise in the city. The study showed that 25% of children have asthma and that in the last 17 years, the cases of chronic coughs among children went up from 10 to 21%. However, Dr Rahul concedes that the health hazards posed by garbage burning should be studied in greater detail, particularly among the population that is not suffering from heart attacks. “We need to do a larger population study, including those who are not suffering heart attacks to understand the effects better,” he says. 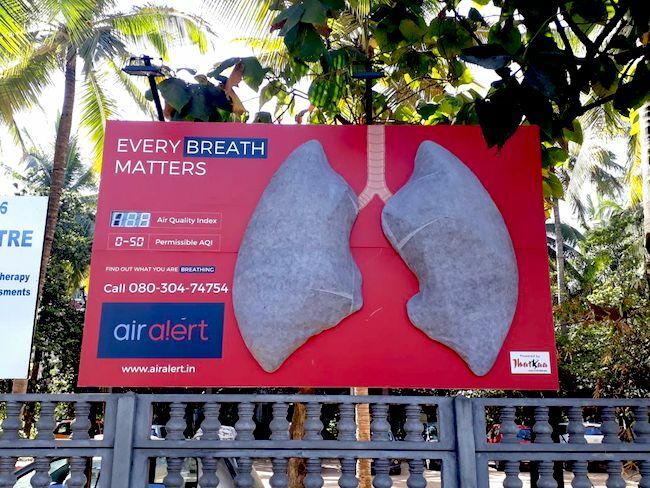 To highlight the issue of Bengaluru’s air pollution, Jhatkaa.org put up a lungs-shaped installation outside Sampurna Mountfort College on Old Madras Road in January (image above). The white lungs were fitted with an HEPA filter (also used in pollution masks), and within days of being installed, had turned black due to the pollution on the busy road. Jhatkaa.org has now sent pieces of the blackened filter to ministers, Central and State Pollution Control Boards and other decision makers to underline the gravity of the issue. Even though open burning of garbage is illegal, cases of burning continue to be reported in the city. Activists point out that the lack of enforcement of fines on contractors is one of the reasons for this. According to RTI replies by the BBMP, no penalties have been levied on contractors for burning of garbage in Yelahanka and Byatarayanapura zones while officials in Rajarajeshwari Nagar and Jayanagar declined to answer whether fines have been levied against contractors in their area. There is no shortage of solutions to solve the issue. The Karnataka High Court had asked the BBMP to create ward-level micro plans to ensure management of garbage since neither processing plants nor landfills have turned out to be a viable solution for waste management but the ward committees have made very little progress in establishing local composting plants. Only 16 wards have identified a site for establishing a local plant while establishing them is still a long way away. This article has been produced with Jhatkaa.org, as a part of their Stop Garbage Burning in Bangalore campaign.